Distant from Ghelspad, Termana is the second major continent of the Scarred Lands to be described in Gazetteer format. Here, the wicked charduni dwarves challenge the forces of good, and exotic kingdoms rise and fall in the wake of the Divine War. This book includes a history of the continent, and the role it played in the struggle against the titans, information on its diverse kingdoms and cultures, and an overview of its many unique geographical features. 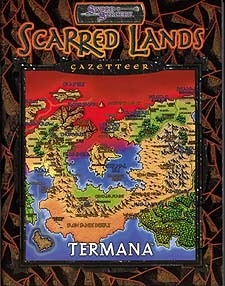 Scarred Lands Gazetteer: Termana provides sufficient information to start a campaign, or as an exotic homeland for characters and NPCs. Termana is also an excellent change of pace for adventueres from a Ghelspad-based camapign.